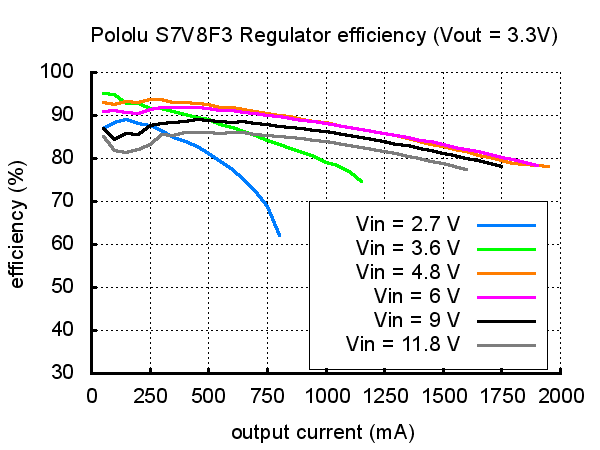 The Pololu step-up/step-down voltage regulator S7V8F3 is a switching regulator (also called a switched-mode power supply (SMPS) or DC-to-DC converter) that uses a buck-boost topology. It takes an input voltage from 2.7 V to 11.8 V and increases or decreases the voltage to a fixed 3.3 V output with a typical efficiency of over 90%. 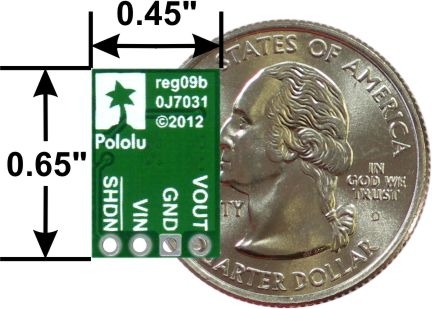 The input voltage can be higher than, lower than, or equal to the set output voltage, and the voltage is regulated to achieve a steady 3.3 V.
A 3-cell battery holder, which might have a 4.5 V output with fresh alkalines or a 3.0 V output with partially discharged NiMH cells, can be used with this regulator to power a 3.3 V circuit. A single lithium-polymer cell can run a 3.3 V device through its whole discharge cycle. In typical applications, this regulator can deliver up to 1 A continuous when the input voltage is higher than 3.3 V (stepping down). When the input voltage is lower than 3.3 V (stepping up), the available current decreases as the difference between the voltages increases; please see the graphs at the bottom of this page for a more detailed characterization. The regulator has short-circuit protection, and thermal shutdown prevents damage from overheating; the board does not have reverse-voltage protection. 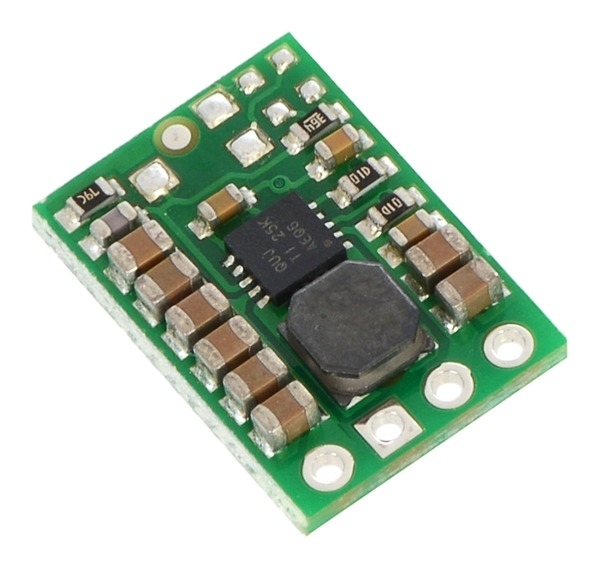 This regulator is also available with a fixed 5 V output and with a user-adjustable output. The step-up/step-down regulator has four connections: shutdown (SHDN), input voltage (VIN), ground (GND), and output voltage (VOUT). 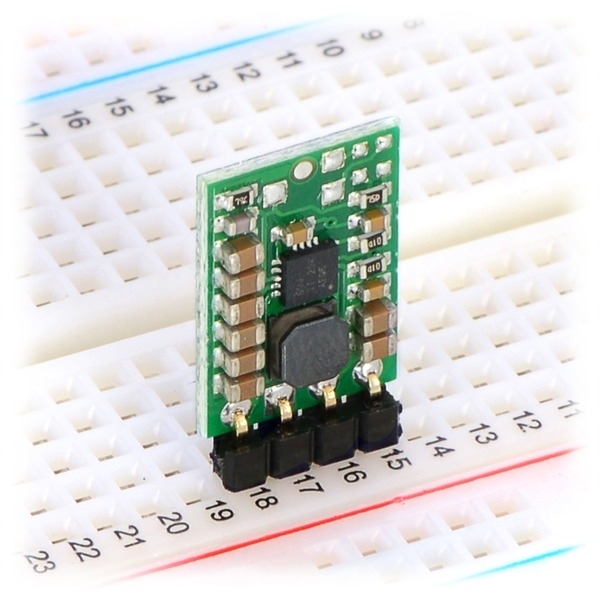 The SHDN pin can be driven low (under 0.4 V) to power down the regulator and put it in a low-power state. The quiescent current in this sleep mode is dominated by the current in the 100k pull-up resistor from SHDN to VIN. With SHDN held low, this resistor will draw 10 µA per volt on VIN (for example, the sleep current with a 5 V input will be 50 µA). 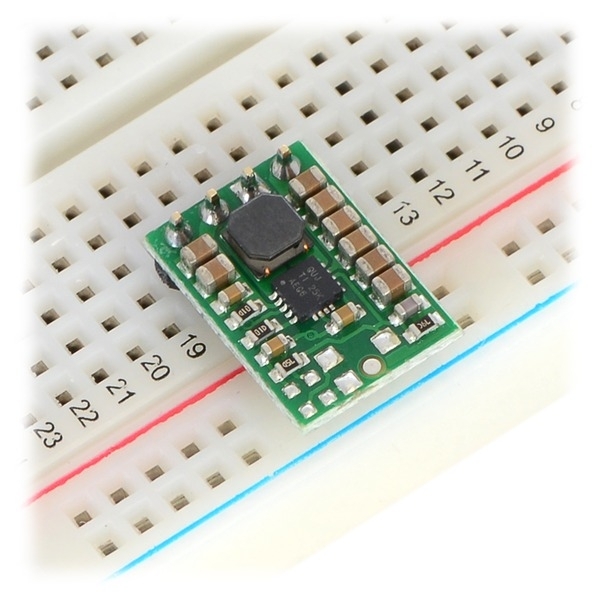 The SHDN pin can be driven high (above 1.2 V) to enable the board, or it can be connected to VIN or left disconnected if you want to leave the board permanently enabled. 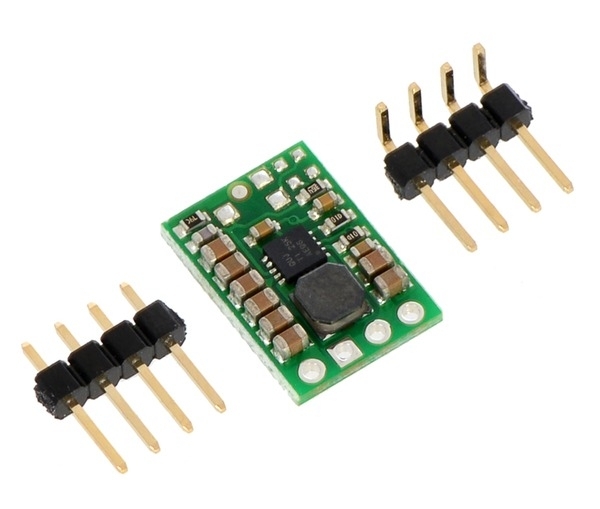 The output voltage, VOUT, is fixed at 3.3 V. The output voltage can be up to 3% higher than normal when there is little or no load on the regulator. 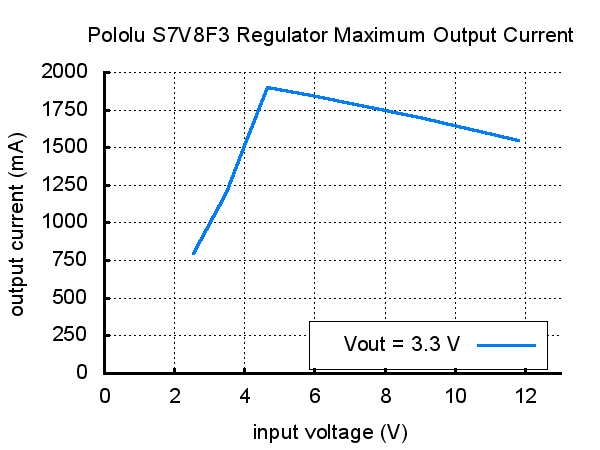 The output voltage can also drop depending on the current draw, especially when the regulator is boosting from a lower voltage (stepping up), although it should remain within 5% of the set output. The efficiency of a voltage regulator, defined as (Power out)/(Power in), is an important measure of its performance, especially when battery life or heat are concerns. As shown in the graph below, this switching regulator has an efficiency between 80% to 95% for most applications. A power-saving feature maintains these high efficiencies even when the regulator current is very low. The maximum achievable output current of the board varies with the input voltage but also depends on other factors, including the ambient temperature, air flow, and heat sinking. The graph below shows output currents at which this voltage regulator’s over-temperature protection typically kicks in after a few seconds. These currents represent the limit of the regulator’s capability and cannot be sustained for long periods, so the continuous currents that the regulator can provide are typically several hundred milliamps lower, and we recommend trying to draw no more than about 1 A from this regulator throughout its input voltage range. 2.When stepping down; current available when stepping up depends on input and output voltages (over 500 mA in most configurations). 3.While enabled (SHDN = HIGH) with no load. Actual quiescent current depends on input voltage.